The "Management" – Rulers of the House! Above is an old picture of me, Thai, with Kentou laying on me. 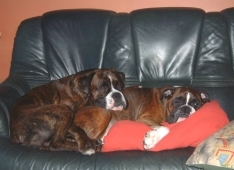 I had a nice cushion and a boxer dog blanket. I used to call him the young wiper-snapper, but that fell on Tenjin (see his picture below) when he came. You may not have guessed, as after all you are human, but all our names come from the Martial Arts or the Japanese language. For example, my name Thai, as in Thai Boxer, Kentou, meaning Boxing (i.e. a Boxing Boxer; funny or what!! ), Tenjin is the God of Learning, and Suki is a name meaning love one, to like or beloved. Yes our parents have a bit of a sense of humour, why they couldn't call us Bruno or Henry, I don’t know! That would have been difficult for Suki, she a girl!! You can read more about us on our individual pages, for information such as our age and pedigree. To think we have regal blood in us WOW! Yes we are pedigrees, better than our owners they don't have any winning linage. 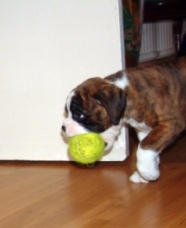 Here is Tenjin 6 weeks old sneaking off with my ball. He can just fit it into his mouth.